'Successful Pubs and Inns plots a clear course towards successful innkeeping. It is ideal for those planning a career in the licensed trade, professionals already within the business and for students. It is of particular value to those who are considering acquiring their own pub, be it freehold, leasehold or tenancy. It gives clear direction on the vitally important process of initial selection and evaluation, highlighting the many pitfalls that will be found along the way. It details the controls required to maximise profit and reduce the risk of financial failure. 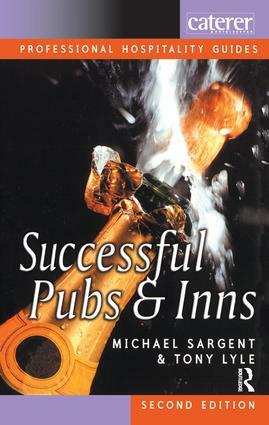 Michael Sargent after an early career in marketing, ran a successful inn before moving into managing groups of pubs, becoming a director of pub operating companies. He now concentrates on writing. Tony Lyle has had considerable experience in senior roles in the licensed trade with responsibilities for large groups of pubs throughout the south of England. He now runs his own licensed trade consultancy specialising in leasing, appraisals, acquisitions and rent reviews. Preface; So you want to run a pub? ; What pub do you want? ; The choice is yours; Setting out your stall; Running the business; Staff and customers; Profit control; The perfect pint; Profit from food; The downside; Keeping the law; A way of life.